Thank you for trusting us in providing your internet service. We are glad to inform you that soon you will be enjoying our new mail service system with spam and virus free, commencing on December 11, 2004. So, how soon is soon? I had 57 spam messages today; take a bow Indosat. Four years ago, physician and surfer Dr. Dave Jenkins chartered a luxury yacht in the Mentawai Islands with one goal in mind: to find perfect waves. The surf proved to be everything he had hoped for. 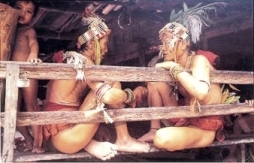 What he also found, though, were the Mentawai islanders – mostly women and children – suffering and dying from the ravages of malaria and other preventable diseases. Troubled by the inequity of lifestyles and moved by compassion, Dr. Jenkins went on to establish SurfAid International, a non-profit organization dedicated to the alleviation of human suffering through community-based health programs. With the support of volunteer doctors and nurses, the international surfing community, and most importantly the Mentawai people themselves, SurfAid has come to exemplify the healing power of cross-cultural partnerships. And now nearly six weeks after the tsunami, SurfAid continues to expand its emergency response to provide desperately needed medical attention to remote coastal villages of Simeulue Island in Aceh. SurfAid is reaching a population of over 20,000 to prevent the widely-predicted next wave of disaster through communicable disease control and health-education clinics. SurfAid is also funding reconstruction, household and food supplies which are being distributed in partnership with private surf-industry relief operations, Sumatran Surfariis and SSRO. Subscribe to their newsletter for more information. a – q includes lots of stuff which Jakartass gives such as clever, concise political opinion (most readers prefer these consistent with their own views) and great finds: resources, blogs, essays, artistic works. a – h includes constructive criticism, reaction and feedback, ‘thank you’ comments and why readers liked their post, and requests for future posts on specific subjects. Hence today’s posting. Happy to oblige. And now for something more important: Charles and Camilla announce their elopement.